Eschew the tourist crowds and head to Inner Canyon and Kolb Studio. Step out of the city life by going to Mooney Falls and Powell Point. When in Grand Canyon National Park, make a side trip to see Havasupai Falls in Supai, approximately 1h 05 min away. 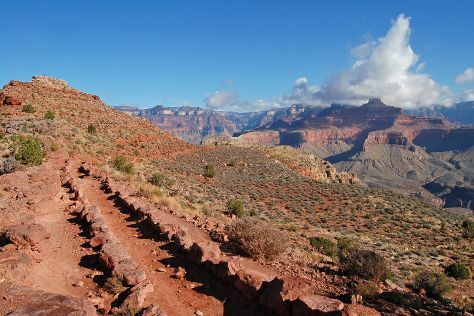 On the 25th (Wed), hike the day away at Bright Angel Trail. There's much more to do: trek along South Kaibab Trail, admire the striking features of Lookout Studio, get great views at Yaki Point, and take in breathtaking views at Grand Canyon South Rim. To see other places to visit, more things to do, ratings, and more tourist information, read Grand Canyon National Park route maker app . In April in Grand Canyon National Park, expect temperatures between 61°F during the day and 26°F at night. Finish up your sightseeing early on the 28th (Sat) so you can travel back home.